Manly Council January 1877 - May 2016 - The Baird Liberal State Government forces through Council amalgamations which will see Manly Council merged into a new Northern Beaches Council. The 12th of May 2016 is a sad day for local government representation and democracy in NSW. Big business wins out and the public lose their say in local government. Manly is the renowned seaside suburb located seven miles from Sydney - Australia's largest city. Manly is a unique blend of outstanding natural beauty, with world famous surfing beaches, combined with a mix of heritage and modern architecture. Manly was incorporated as a Local Government Municipality in 1877. Popular with locals and tourists alike, Manly's growth and development has been heavily linked to its ferry service. This commenced in 1855 and connects Manly to the City. In July 2012 Manly ferries were franchised to the private sector - see the franchise agreement contract documents. In September 2013 there was a major periodical ticket cost increase, when Manly ferry users were forced to buy the MyMulti3 ticket instead of the initial MyMulti1 periodical - in fact MyMulti3 is the same ticket used by train commuters from Newcastle to Sydney! The change in MyMulti validity, combined with the replacement of Sydney's existing MyZone magnetic-stripe ticketing system by the new Opal contactless smart-card has effectively increased advance purchase Manly Ferry fares by 15% and more over the last 12 months. Check the discount tables to see how you fair if you use the Opal Card compared to the now discontinued FerryTen, and Quarterly and Annual periodical tickets - particularly before the 2013 validity change. 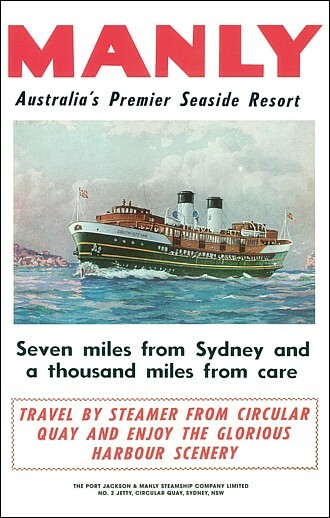 All Manly Ferry Annual Reports produced in electronic format (html or PDF) are maintained available on-line from this web site (as with changes of entities including private sector franchising of previously State-operation, they no longer exist on the original web-servers). A now historic analysis of the former Sydney Ferries Jetcat operation, that ran between 1990 and 2008, is also available. The withdrawal of Panasonic's last VHS Video Cassette Recorder, the DMR-EZ48V, in August 2012, marks the end of a 30 year era. Harbourlink, Sydney's Darling Harbour Monorail, opened on the 21st July 1988 and was closed on the 30th June 2013. Read about the Monorail System and preservation efforts.